Debbie Roark, Mary Barton Akeley Smith, Ray Rice and Brett Varnum signing the paperwork at the ceremony. The Multipurpose Room at UMPI was packed on Oct. 23. Mary Barton Akeley Smith was giving $1 million dollars to the university to create its first endowed chair. She gave the gift in memory of her late husband and named the gift after her father, Dr. Robert Vinton Akeley. The faculty position that this gift will fund was named Dr. Robert Vinton Akeley Chair of Agricultural Science and Agribusiness. Akeley helped with the release of 40 potato varieties, including the Kennebec. He was from Presque Isle but was known throughout the country for his potato breeding. He was also the leader of the United States Department of Agriculture’s National Potato Breeding Program and had over 100 publications. The ceremony was very well attended. It included speeches from President Ray Rice, benefactor Mary Barton Akeley Smith, Dean Jason Johnston and others whom this wonderful gift will benefit. “We really appreciate this gift and wanted to make sure we showed it,” Jason Johnston said. And they did. Around the room were printed photos of Dr. Akeley working with his beloved plants and colleagues. Roaring applause and a standing ovation greeted Mary Barton Akeley Smith’s touching story of giving back to her original community of Presque Isle. She lived here as a child before moving to California and wanted her father’s legacy to endure. 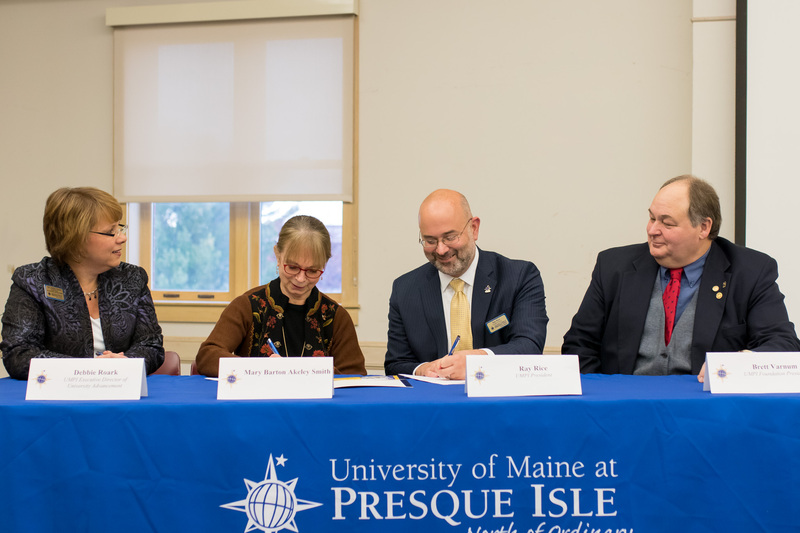 UMPI has big plans for Smith’s gift by first hiring a new full-time faculty member and then using the money to continue to develop the agriculture major by purchasing new equipment, helping to build a new greenhouse and funding research projects for students.